In countryside near the city. Dead end. Ground floor: living room + bathroom. On The floor: 1 room plus corner cabin with bed in 90.. Possibility of 2 to 3 people. Quiet corner. Sunny. Private pool for rental; terrace, solarium, not overlooked, .Salon alarm garden under pergola, barbecue. Front; flowery garden with outdoor games for children. Secure gated courtyard with electric gate, private parking. Bicycle shed. We can advise you for your visits, outdoor runs and recommend a great restaurant. Placeholder in the courtyard, remote controlled gates. Access to independent rental. Small covered terrace behind the tower that could hold machine and bicycles. Private pool terrace, reserved for tenants, security alarm ... Solarium, beach beds Pergolas: garden furniture. barbecue. Not overlooked. Front, access to the flowery garden with outdoor games for children. Good exposure: south. View over green valley. Dead end. Flat screen TV, homecinema, with 400 HD channels canalsat. Eurosport, Chains Children, Cinema, documentaries, etc ... Ushuaia cd player and dvd .Livres for children and adults. Possibility broadband internet connection via wifi. Plus heating if necessary. You only rent the tower which is adequate for a couple with maybe one child. The pool is lovely and the garden has plenty of child friendly elements. The pool has a child alarm and can easily be made secure by use of gates. The property has everything you would need for a weeks holiday in summer ( but might be a bit cramped in winter time). The owners are the most delightful people you could ever wish to meet although they speak hardly any English. 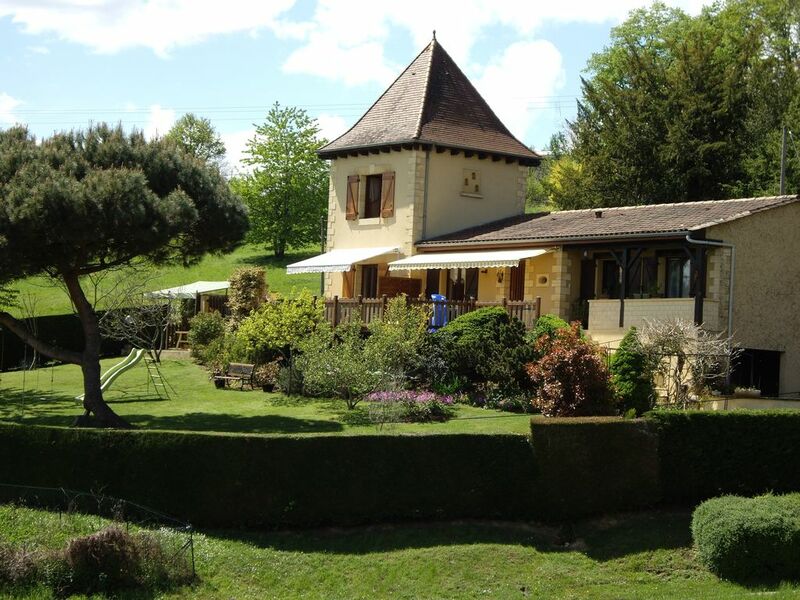 Situate 5 minutes from the local supermarket and the beautiful town of Sarlat. There is an endless supply of historic sites within a half hour drive. Literal dozens of restaurants and bars in the town. One thing for the Brits to note is that the pillows are the French square ones so our standard oblong pillow cases are a minor issue. At the price in the beautiful dordogne this is a bargain. Merci beaucoup pour votre sympathique appréciation qui nous va droit au coeur. Espérant vous revoir avec beaucoup de plaisir dans notre belle région. Nous garderons un très bon souvenir de votre passage, et nous prendrons quelques cours d anglais d ici là, afin de nous améliorer. Very good restaurants, close to your location.